I must admit that for some reason, the idea of a blues/sludge combination stirs interest in me. 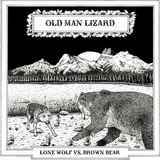 Old Man Lizard's first LP, Lone Wolf vs Brown Bear, fits the bill nicely; it's got some mammoth riffs in there, but still has plenty of traditional guitar-driven blues to give it some flavor in addition to all the heaviness. The vocals are ambient, hoarsely roared, while the guitar has a retro, overdriven sound both on the leads and the main rhythm section. Hypocastinum Warrior is slow and plodding but methodical, with a disorganized feeling, like it's mostly improvised. Keiko's Last Smile is more melodic, but just as heavy, while Return of the Wilderbeest is pounding and thunderous, with a rock beat instead of the bluesy swinging common on the rest of the album. Even on the mostly quiet pieces, such as Wolves' Wood and its successor that the band smoothly transitions into, Rum Guts, heaviness leaks out from behind the clean, ringing tones of the guitar used like water leaking from a crack in an enormous dam that is about to break. When it comes down to it, the vocals take third place. Old Man Lizard's real strength is as an instrumental band, and their songwriting ability is showcased by their command of their instruments, while the vocals hide provide atmosphere but are used very sparingly. Don't Piss in the River is a prime example -- sure, it's not completely instrumental, but with the production putting the lead guitar's multi-string riffs in the foreground, that part definitely takes center stage. All those little guitar riddles throughout the song not only make it more interesting and less of an exercise in pure doom riffing, they also increase the melody substantially. And in the age of the MP3, this is not something seen as often as it used to, but they have a hidden track at the end of the final song, Sea of Witches, in which they do a banjo instrumental. I rather wish they hadn't saved that for a hidden track, as it sounds really cool, but one can't have everything, I suppose. Lone Wolf vs Brown Bear is an interesting album that certainly bears some resemblance to other modern British sludge/doom bands' work, but still stands out from the rest in its instrumental strength and blues backing. It's definitely worth a listen or two.